The name "Gloom Bringers" was created by Daniel Lim in the naming contest on 26 Mar 2012. 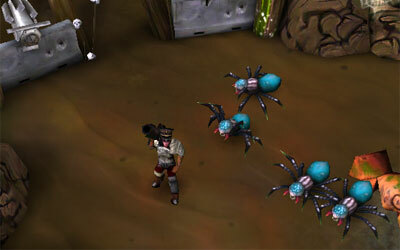 The gloom bringer minions are the small spiders. They crawl around and give people poisonous bites. They usually start off slowly but would speed up and bite the players. Some gloom bringer minions may "hatch" from the eggs when the eggs got destroyed. The gloom bringer minions usually come in groups and can be dangerous as their bites slow down the player. A gloom bringer minion may drop silver and speed boosts. In coop multiplayer, a gloom bringer minion has a base score of 10 and the gloom bringer champion has a score of 400. What makes gloom bringer minions hard to deal with is their size. Since these things are small, it is hard for one to aim at them (this is the developer's intention), especially when the gloom bringer minions get close enough to the player. And the gloom bringer minions can inflict a lot of damage to a person who stands still. So the best way to deal with them is to keep a small distance from them, and if possible, use a flamer or a shotgun against them as these weapons do not require one to aim accurately. To reduce the chance of getting hit in coop multiplayer, it is advised to keep a certain distance from the gloom bringer minions first, and use speed boosts to maintain the distance from them. If you use a shotgun, wait until they speed up and hit them as they almost get to you. The shotgun is effective when the gloom bringer minions just get in range.